This port with refined characteristics is obtained from noble grapes and vinified in “Lagares” (crushed by foot). After 2 to 3 years in oak barrels, aging is completed in the bottle. Dark red, almost black color. An aromatic nose of blackberries. Medium-bodied Port with lots of fruit. 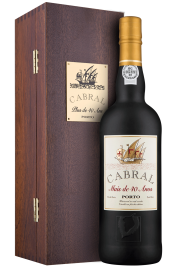 Balanced vintage, intense but well-integrated tannins and a velvety, long and fruity finish. Excellent with desserts consisting primarily of chocolate, berries, strawberries or raspberries.